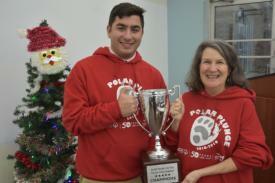 During a special presentation at Iona Preparatory Upper School on December 17, 2018, Special Olympics New York Director of Development Kaitlin Brennan awarded the Plungers with their fourth consecutive “Cool School Challenge” trophy. The team’s fundraising will sponsor more than 100 Special Olympics athletes, who will now be able to participate in the Olympic-style sports programs for free. 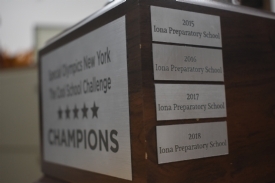 Patricia Gray, who moderates the Plungers club and teaches English at Iona Preparatory, said she is so proud of all that the students do by not only fundraising, but advocating for Special Olympics and its athletes. 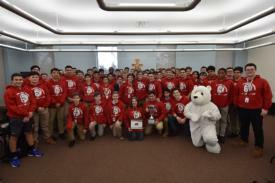 This marks the eighth time in 10 years that the Prep Plungers were the top Westchester school (predating the Cool School Challenge). They were also the top overall team in Westchester in 2010 and 2011 and have raising close to $200,000 for Special Olympics athletes since the inception of the Westchester Polar Plunge.